The latest BRE Family Tree update is here. There you can download the new family tree in jpg, png, or tif formats. We have redesigned the family tree to show a lot more information than before. To make the chart less commercial, we got rid of the colors that indicated which BRE vendors were BIZRULES partners. Now the chart can be used by anyone, vendor, salesman, consultant, or customer who wants to see "the state of the BRE market" or who wants a guide to help them select their BRE vendor. This new diagram also shows the connection to Rete, CLIPS, Jess, and Drools. Rule engines that use the Rete algorithm have an "R" flag. Engines based on CLIPS have a "C" flag. and engines based on Jess have a "J" flag. We also show what environments each rule engine runs on (i.e. COBOL, C++, Java, and .Net), and whether it runs natively on that environment. This section is still under construction. We've asked BRE vendors to confirm this information, so we can finalize this section. We planned to present this chart for the first time at the upcoming October Rules Fest conference in Dallas, TX. 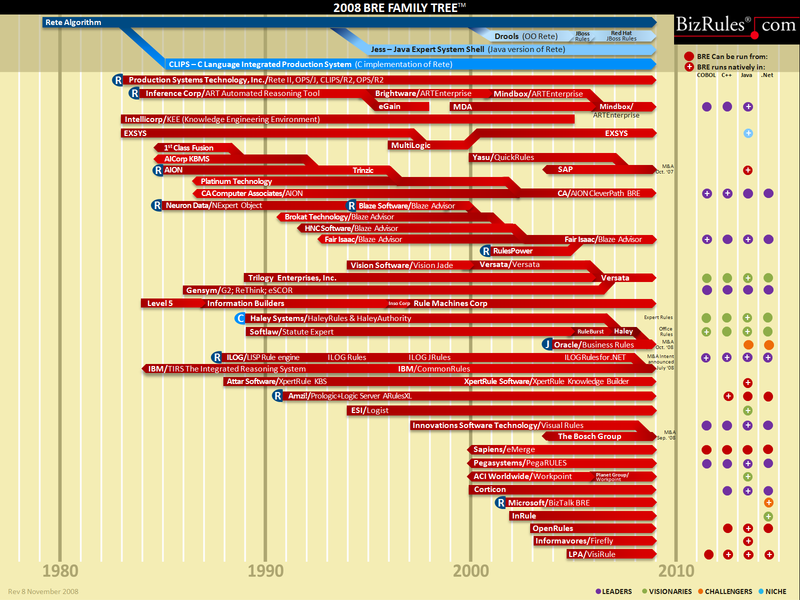 But now that IBM and ILOG are uniting, I thought you would like to see this chart now. If you are a vendor representative, please take a look at your product data and let us know if we missed anything or if you'd like to update your product information. This is a guide to many of the leading BRE vendors that we are familiar with. It is not an exhaustive or complete list - there are probably other BREs on the market and not on the list that we haven't even heard of yet. Let us know who you are! This guide is a good start for companies trying to evaluate and assess the BRE market. If you need more information about these BRE vendors, or if you need help selecting the best and the right rule engine for your particular needs, call BIZRULES at 305.994.9510. Some of you have asked for the BRE Family Tree poster... Call us for info about that. IBM is one of the few companies that sets the course in technology. Now they will use ILOG to steer the ship. IBM has announced their intention to buy ILOG for $340 million USD. ILOG is widely recognized as one of the leading BRMS software vendors. This move helps legitimize business rules management systems (BRMS) and rule engine technology. This will shake up the playing field in the BRMS/BRE space as ILOG BRMS competitors aligned with and partnered with IBM will need to rethink their strategy and technology. Integrating ILOG BRMS with IBM's BPM and SOA technologies will also raise the bar in the BPM/BRMS space. Pegasystems has been a leader in the BPM/BRMS space, which Pega basically invented, ever since they released their PRPC PegaRULES Process Commmander product. BPM vendors lacking BRE capabilities are going to have to start OEMing a BRE tool, building one, or buying one like IBM did. This move also speeds up the BRMS market consolidation that has been picking up steam in recent years. Last year SAP acquired the Yasu rule engine, and Ruleburst (previously SoftLaw) acquired Haley Rules. Prior to that, of course, Fair Isaac acquired RulesPower, and Trilogy bought Versata then Gensym. Going further back, CA bought Platinum Technology (which had acquired AION and the AION BRE). AION, of course, was started by a bunch of ex-IBMers, who wanted to improve on IBM's TIRS (The Integrated Reasoning Solution) mainframe rule engine, who left IBM to develop the AION rule engine. After TIRS, IBM began working on Common Rules. That IBM rule technology and research effort could be combined with ILOG's BRMS tool in the future. IBM also plans to embed ILOG rules technology across its broad product offerings, further strengthening their products and further legitimizing rules technology. The business rules market is alive and well. The tools are getting better. The vendors are getting larger. The methodologies are getting easier. As rules-based tools become more widely adopted, companies will be able to spend more time designing quality rules and managing effective rules, and less time worrying about the rule engine technology under the hood. Companies that resisted rules technologies and methodologies in the past almost missed the boat. Now they have another chance to get on board the rules express. IBM is ready to rule again.